Publisher: White Mule Press, 2009. Soft Cover, 62 pages, 6x9. The brewing techniques described in this book are the same as Bill Owens used at his brewery, Buffalo Bill's Brewery located in Hayward, California. 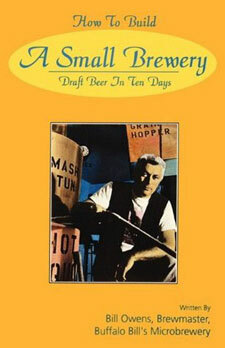 Bill's six barrel brewhouse uses the same tower (gravity) brewing method as described in this book. A ten gallon brewing system can be built in a couple of weekends. This book explains how, on your first brew, you can produce wonderful, cold, clear and carbonated beers in just 10 days.